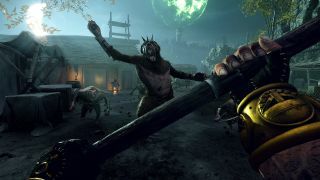 Sign up and get a key for Vermintide 2's Shadow Over Bogenhafen DLC. This month, we're sending Legendary tier members of the PC Gamer Club a Steam key for Shadow Over Bogenhafen, the first DLC pack for our best co-op game of 2018, Warhammer: Vermintide 2. This is to celebrate the announcement of Vermintide 2's first paid expansion, Winds of Magic. The best part is, if you're a member of the Club, you can read our exclusive cover feature in the digital magazine—one of the other perks of joining up at the $5 tier. As well as adding two maps to the game that you and three other pals can battle through, it throws in a bunch of new quests to tick off. Obviously, you'll need to own the base game of Vermintide 2 to be able to redeem this, but then you're good to go. Get more out of a great game, and receive a slew of other benefits in joining up. Find out more about the PC Gamer Club here. You can join up from anywhere in the world.